Have procrastinated a little getting this post written but the good news is, the first condition inspection has revealed no significant issues with the DOG Aviation RV-12. However, I did run across a couple of speed bumps that created delays. One time consuming task was looking up the torque values for all the hardware on the airplane. I’m not referring to the standard torque values for AN3 or AN4 bolts which builders have well memorized by the time the airplane is completed … no, I’m talking about the myriad of parts that have unique torques such as Matco brake hardware, the Rotax engine hardware, propeller bolts, etc. Plus, there is the time spent sifting through the documentation for additional information such as tire pressures, stabilator cable tensions, nose gear breakout forces, etc. Tip for builders: My suggestion is while assembling the RV-12 each time you run across a nonstandard torque value, breakout force, gap measurement or pressure reading document it on a list that can later be tailored to suit your needs via a word processor or spreadsheet. Having a list that shows torque values, clearances, breakout forces, spark plug gaps, etc. will make the first condition inspection on your RV-12 or any kit aircraft move along so much faster and all inspections thereafter. In fact, I would also suggest taking things one step further by making a complete list or spreadsheet of inspection due dates for items such as testing of the transponder and the required quarterly ELT test … in addition, include expiration/replacement dates for items such as the batteries in the ACK E-04 (I did record the main battery for the ELT in the avionics log but did not record the battery dates for the associated remote panel indicator or audio alert indicator) along with dates for firewall forward items such as fuel pump replacement, rubber hoses, brake fluid, coolant, etc. Wish I had thought about creating those lists during the construction process. Moving forward, assembling a meaningful list related to inspection items along with perhaps keeping a white board in the hangar will make future inspections much less time consuming. I spotted a white board in the hangar across from me and thought it was a good idea so took a photo of it to use as a guideline for making my own white board. 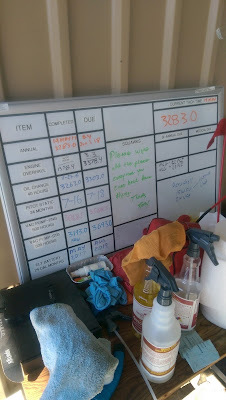 Photo of a whiteboard spotted in a hangar across from me. There seems to be merit in creating a white board for keeping a visual on major inspection due dates and time related items such as oil changes. Decided to begin the condition inspection at the nose of the aircraft and move aft. Van’s documentation suggests checking the torque of the propeller hub after the first six hours … I went beyond that knowing the annual was nearing. For the benefit of non-aviation readers of the Blog, the two Sensenish propeller blades are captured between two half hubs … the one called the mount hub is bolted to a mounting flange attached to the propeller shaft coming out of the gear reduction unit on the front of the Rotax 912ULS engine and the other is called a clamp hub which captures the two propeller blades and is bolted to the mount hub. Unfortunately, to check the mounting bolt torque on the mount hub, it requires removing the clamp hub and both propeller blades. It would be nice if the bolt heads sat in a recess or up against a stop so the bolts would not rotate allowing the bolt torque to be checked without removing the blades … but sadly, that is not the case so the clamp hub and blades need to be removed to gain access to the mount hub bolt heads. As it turns out, the nuts on two of the six bolts moved slightly when the torque was checked … the required torque is 18-20 foot pounds so I was shooting for 19.5 lbs. to allow for a little drag in the locknut. These are the nuts and bolts that attach the mount hub onto the mounting flange. Unfortunately, to properly check the bolt torque it requires the removal of clamp hub and propeller blades to gain access to the heads of the bolts. 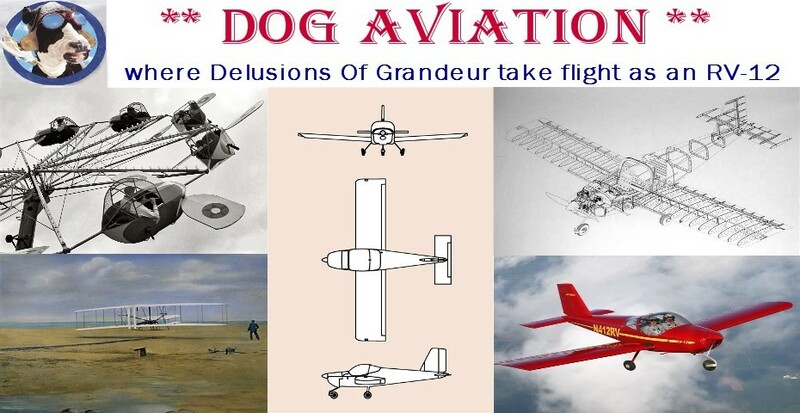 Avid readers of the DOG Aviation blog may recall when the propeller blades were first installed they were pitched wrong and after posting photos of the work session, I received an Email from a fellow builder who caught the error (thanks again Nick). This required loosening the clamp hub bolts a couple of extra times while readjusting the blades. Unfortunately, Nord-Lock washers self-destruct a little each time a bolt is loosened, so they are only effective for a few cycles because the capturing ridges on the washers get worn down easily. Knowing this, I figured the Nord-Lock washers should be replaced since they had been exercised a few times already… so prior to beginning the condition inspection, I purchased new Nord-Lock washers at a local bolt & nut supply. Well, much to my surprise, when about to use the new Nord-Lock washers, I discovered they were a much smaller outer diameter than the Nord-Lock washers supplied by Sensenich with the propeller kit. This resulted in a parts delay because I needed to order new Nord-Lock washers directly from Sensenich. So my tip to fellow RV-12 builders is to plan ahead and have some spare Nord-Lock washers on hand when planning to remove the prop mounting bolts … just make sure the Nord-Lock washers are the larger diameter ones. On the left is a used Nord-Lock washer removed from the propeller hub and split in half to reveal the worn ridges on the washer. On the right is a new Nord-Lock washer split in half so the locking ridges can be seen. Also note the outside diameter of the standard Nord-Lock washer on the right that was procured locally has a much smaller outside diameter than the Nord-Lock washers supplied by Sensenich on the left. The new Nord-Lock washers received from Sensenich were placed in the digital caliper and measured in at 21/32". So fellow builders attempting to locally source Nord-Lock washers for the propeller bolts, make sure you purchase washers that have an outside diameter of 21/32" … otherwise you will need to place an order through Sensenich. The Nord-Lock washers that Sensenich supplies for the RV-12 propeller utilizes a washer with an outside dimeter of 21/32" which is a larger OD than typical for a 5/16" diameter bolt. Link to the procedure for adjusting the Sensenich propeller blade pitch on the RV-12. About the only item I found that NEEDED correcting was the temperature thermostat for the Reiff heating system … it had popped off the oil tank. Frankly, I was not surprised to see this because when installing the Reiff heating system I began by scuffing up the aluminum on the bottom of the engine and cleaning with Acetone then mixing the epoxy and attaching the heating pad to the bottom of the engine. Then without thinking I slathered the thermostat for the oil tank with epoxy and affixed it to the side of the oil tank …. only to realize, darn (not the word I used at the time) I had not yet scuffed the oil tank and cleaned it with Acetone before applying the epoxy. Figured it was too late to do much of anything, so the thermostat would either stick, or not … which ended up being the case. To correct the problem all the old epoxy was cut off the thermostat and the oil tank with a razor and both the oil tank and thermostat were roughed up with sandpaper and a jewelers file. Reiff suggests using JB Weld as a substitute for the epoxy they supply with the heater kit, so that is what was used for the repair. The JB Weld was applied in two applications. The first application was to the bottom and sides of the thermostat so a piece of safety wire could be placed around the oil tank and tightened to keep the thermostat pressed against the oil tank while the epoxy cured. After the epoxy cured, the safety wire was removed and a second application of epoxy was used to cover the top and sides of thermostat. Hopefully this will no longer be an issue … but moving forward, this will be an area I will be keeping an eye on especially now that winter is coming and I’ll be using the heater. My finger is pointing to the oil tank thermostat for the Rieff heating system that was epoxied back onto the oil tank using JB Weld epoxy. This time both the thermostat and oil tank received a good scuffing and cleaning with Acetone … hopefully the thermostat it will stay affixed to the oil tank.